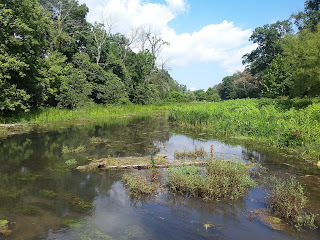 As evidenced in two previous blog posts (here and here), last month, I took a trip into central Virginia--the Shenandoah Valley--to follow in the footsteps of my three-times-great-grandfather, James Crozier Huhn. 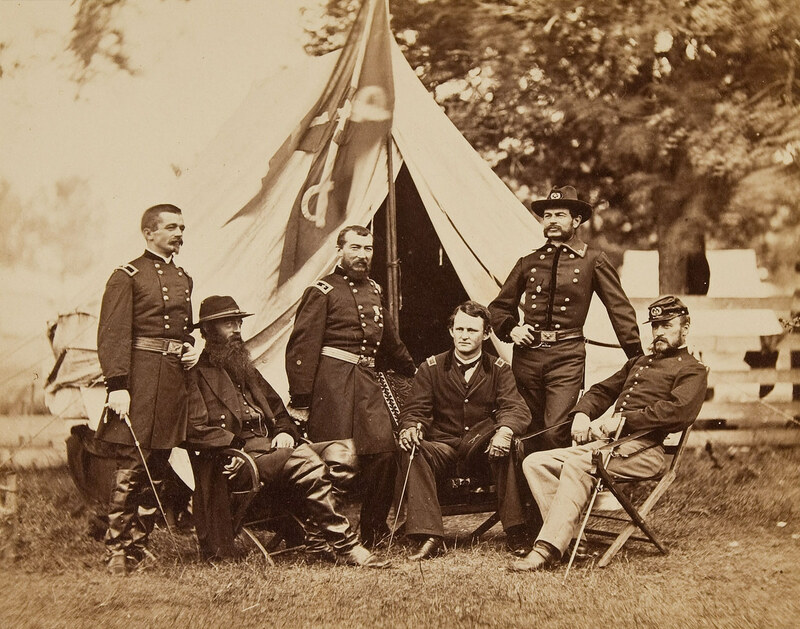 He was a blacksmith in the 14th Pennsylvania Cavalry, and his unit took part in most of the major engagements of the Shenandoah Campaign of 1864. The largest of those engagements was the Third Battle of Winchester. As the name might suggest, Winchester saw a lot of action during the Civil War, including three large-scale engagements. It was in a strategic point at the north end of the Valley, pointing right towards Washington DC to the east. Important roads and railroads led from the west--particularly from the Ohio Valley--to the east and passed through or nearby Winchester. The First Battle of Winchester took place in 1862; "Stonewall" Jackson routed Union general Nathaniel Banks. In 1863, Confederate general Richard Ewell defeated a force at Winchester on his way north into Pennsylvania, where he would take part in the Battle of Gettysburg. In 1864, Union general Philip Sheridan had only recently been placed in charge of the army in the Shenandoah. It was an important election year, and Sheridan had been told specifically that whatever he did, he must not lose a battle. With the stalemate in Petersburg and with Sherman incommunicado somewhere in Georgia, Abraham Lincoln couldn't politically sustain another military loss. And if he lost the election, then the Democrats would win, and they were promising to negotiate a peace with the Confederates. Sheridan, as ordered, was cautious. Confederate general Early took this caution as cowardice. But by September, Sherman had taken Atlanta, and Sheridan had the green light to be more aggressive. him are Merritt and Torbert, cavalry commanders. including the 14th PA Cavalry under its commander, Col. James M. Schoonmaker, came sweeping down from the north along the Valley Turnpike. They came upon the Rebel defenses at Star Fort, directly north of town (which had been there since 1862). The 14th PA Cavalry charged unsuccessfully twice, dismounted, and tried again, this time with more success. Col. Schoonmaker won a Medal of Honor for his bravery that day. With a successful cavalry assault to the north and west of town (on the Confederates' left) and the Union infantry finally cracking the Confederates to the east of town (on the Confederate right), the day went to the Union. The Confederates were forced to retreat, and they beat a path for Fisher's Hill, where there would be another sizable battle just a few days later. (See my blog post about Day 2 of my trip, when I visited Fisher's Hill.) It was the beginning of the end for the Rebels in the Valley; as with Lee's army across the mountains, the Confederates in the Valley really couldn't afford the casualties they incurred (about 3,600). They would be defeated at Fisher's Hill, Tom's Brook, and finally at Cedar Creek, precipitating what was known as The Burning. Like Sherman in his famous March to the Sea in Georgia, Sheridan cut a swath of destruction through the Shenandoah Valley, burning barns and supplies that might be useful to the army. To be fair, civilian property was generally not destroyed unless it could help feed or supply the Confederate Army. It was yet another factor in the breakdown of the Confederate war effort, since the Valley was so vital in supplying Lee's Army of Northern Virginia. The subdivision had street names like Sentinel Drive and Caliber Court, which we had to admit seemed like a clue. We could also tell that the subdivision was placed on a high spot looking down not only on the town of Winchester but also on the train tracks below. We agreed that if they were gonna build a fort, that was a fine place to put it. But damned if we could find it. If we'd been paying closer attention, we might have noticed that the main road through the subdivision was Fortress Drive and that we had driven past a little sign that said "Star Fort." On our way out, we saw the sign. We stopped and hopped out. I realized on this little trip to the Valley that you can never be quite sure what to expect of a historical site. Sometimes it's a few paths mowed through an open field on a hillside, like at Fisher's Hill. Sometimes there are houses and barns and tunnels under freeways, like at New Market. Sometimes, there are acres of fields, miles of fencing, and scores of monuments like at Gettysburg. Sometimes there's a wet, grassy path off a subdivision street that passes into a woods and then opens onto a grassy clearing, like at Star Fort. spot. What's there now is the earthworks that were once part of the fort: grassy berms roughly sketching out a circle. Beyond the earthworks are the ditches that ran along the front of the fort's walls. Today, it's just mounds of earth surrounded by trees and then houses, but in 1864, the place would have been completely devoid of trees for quite a distance. What good is a fort overlooking the town if there are trees blocking the view? the Third Battle of Winchester, so we trudged around and looked at them all. One even told about Col Schoonmaker's Medal of Honor-winning heroics ("Hey, that was my great-great-great-granddaddy's commanding officer!"). The grass was still damp from the morning dew, and it was already getting warm, so after walking around the old earthworks for a little while, we headed back to the truck, pleased to have found the elusive--well, sort of--Star Fort. visualizing battle maneuvers--just not my thing.) Later in the day, the Confederates were pushed back towards town and eventually broke and retreated (as I mentioned) to Fisher's Hill. The ground there is pretty level, but there are a few little hills, and me being me, I awkwardly tried to get my bike into low enough gear to get up the hill, but I failed and fell off. The hills were steep enough that I couldn't get going again, so I just walked my bike to the top of the hills. Clearly, I'm not going to be making the Olympic cycling team anytime soon. In my defense, the bike was a bit too big for me, and my feet didn't quite touch the ground . . . It was a nice morning bike ride, but the sun was getting intense and the heat thick as we called it a morning and headed back to the truck. We packed up out bikes, had lunch at a right across the road from the battlefield park, and then went back to our hotel so I could pick up my car. And that was it--that was the end our three-day adventure following the trail of a Civil War blacksmith. My dad went on to do some business deeper in Virginia, and I headed home. Where will my research take me next? Well, I would like to learn even more about James, if I can. I'd love to visit the soldiers' home in Eerie where he died in 1920, to see if they have any kind of records pertaining to him. I'd love to visit the historical society of Fayette County, where James (and most Huhns until my father) was born and lived most his life, and check the newspapers for any mention of him (I have an obit). So the future may hold more information on my favorite Civil War blacksmith, James C. Huhn.